After Donald Trump secured the Republican nomination this spring, Republicans immediately sounded the alarm about down-ballot races: just the mere presence of the bombastic GOP businessman atop the ticket would, they feared, lose them the Senate majority. Now, with fewer than six weeks until Election Day, the landscape looks a little different. Trump isn’t proving to be quite the albatross Democrats hoped he would be in races across the map, and a handful of GOP incumbents are doing better than their own party expected. Still, Democrats remain optimistic that the math is on their side: they need just four seats they need to take back control of the Senate (or five, if Trump is elected to the White House). The map was going to be tough for Republicans no matter who their nominee was or what happened this year: Republicans are defending 24 Senate seats, compared with 10 for Democrats. And many of the GOP incumbents who are facing reelection battles this year are in blue or purple states, places President Obama won twice. Along those lines, most observers on either side of the aisle say Illinois and Wisconsin are pretty likely pickups for Democrats: both Illinois Sen. Mark Kirk and Wisconsin Sen. Ron Johnson won their seats in blue states during the Republican wave in 2010, and the presidential-year electorate is expected to be far more Democratic than the one that elected them both six years ago. But a few other races that were expected to be top pickup opportunities for Democrats—especially Ohio and Florida—are shifting back in the GOP’s direction, giving the party a glimmer of hope that it might keep the majority long enough to pad its numbers during the red-state-heavy 2018 midterms. “All things considered, Republicans are very happy to be in the spot we’re in right now given the headwinds we thought we were going to be facing heading into Election Day,” said GOP strategist Ryan Williams, a former spokesman for Mitt Romney’s 2012 campaign who now works in a handful of 2016 Senate races. Still, the fact remains that Democrats have multiple possible paths to 50 seats—and only need to win a fraction of the highly competitive races this year to do it. Assuming Democrats were to pick up Illinois and Wisconsin, they’d only need two more states to take back the Senate, and they could take any of a few routes to the majority. Incumbent GOP Sen. 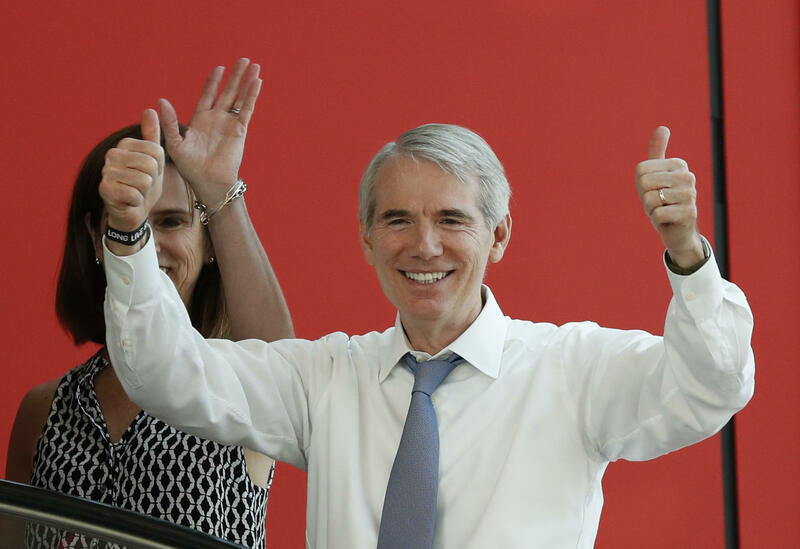 Rob Portman’s seat in Ohio is the prime example of how an incumbent GOP senator can outrun an unpopular GOP nominee. He steered clear of the Republican National Convention in Cleveland this summer, opting instead to campaign elsewhere around the state; that, combined with a strong campaign operation, has put him considerably ahead Democratic candidate Ted Strickland. Now, Portman looks likely to win a second term—enough so that the DSCC and pro-Democratic group Senate Majority PAC scaled back their ad investments on behalf of Strickland. The last CBS News Battleground Tracker poll in Ohio found Portman leading Strickland by 7 points; other public polling since then has pegged his lead as even wider. Florida, too, is another battleground state where Republicans increasingly have the upper hand in the state’s Senate race. Marco Rubio’s surprise decision this summer to run for reelection—a former 2016 hopeful, he had previously insisted he’d be a private citizen next year—effectively cleared the Republican primary field and set him up as the favorite in the race against Democrat Patrick Murphy. A third place where Democrats had hoped for a Trump-based opportunity that isn’t materializing is Arizona, where incumbent Sen. John McCain is vying for a sixth term. Earlier this year, he privately told a group of donors that he’d be in for the “race of [his] life” if Trump were the nominee; now, however, the longtime senator looks poised to win reelection. Even as some races have come off the map for Democrats, the Senate landscape isn’t without some new opportunities for Democrats: and in some red and purple states, too. Blunt still leads in most polls out of Missouri, but only by a few points—and Democrats hope that Kander’s ads and background as a veteran will help pull him over the finish line in November. The same is true in North Carolina, where national Republicans have become displeased with incumbent Sen. Richard Burr’s campaign efforts. Almost every top Democratic recruit, including former Sen. Kay Hagan, passed on the race last year—but as a result of issues both nationally and specific to North Carolina, Burr is now running almost even against the relatively unknown Democratic candidate, Deborah Ross. Indiana is another potential bright spot on the map for Democrats. In this typically red state where incumbent GOP Sen. Dan Coats is retiring, Democrats’ recruitment of former Sen. Evan Bayh this summer gave them a leg up in an otherwise-tough race. Recent public polling in Indiana puts Bayh’s lead over GOP candidate Todd Young in the mid-single digits. When it comes to the true tossups in the race for the Senate, the main states operatives on both sides will name are Pennsylvania and New Hampshire. Both have a first-term incumbent Republican senator looking to win reelection: in Pennsylvania it’s Pat Toomey, while in New Hampshire it’s Kelly Ayotte. Democrats got their favored candidates in both races—Katie McGinty in Pennsylvania and incumbent Gov. Maggie Hassan in New Hampshire—but these Republicans are making the case that they’re willing to buck their party when it matters. Toomey, especially, has an argument to make on that front: his campaign and its allies tout his role in co-sponsoring bipartisan background check legislation. The other incredibly close race on the map is Nevada: Republicans’ sole pickup opportunity on the 2016 map. With Senate Minority Leader Harry Reid’s retirement there, the race —between Democrat Catherine Cortez Masto and GOP Rep. Joe Heck—looks to be every bit as close as the presidential race there. Were Heck to win Nevada, Democrats would need to offset that loss with another pickup somewhere else on the map.